Jul 26, 2005 — Summer at YU has brought 28 incoming high school seniors to Yeshiva University for four weeks this summer, where they are taking classes, meeting other students from all over the world, and getting an insider’s look at New York City. “It has far exceeded anybody’s expectations,” said Aliza Stareshefsky, coordinator of the Summer at YU program, which began July 3 and ends July 31. Students came from nearby Fair Lawn, NJ, and Brooklyn, NY, and as far as Los Angeles and Winnipeg, Canada, to participate in YU’s first summer high school program. “I am excited about being in a modern Orthodox environment and meeting the roshei yeshiva [professors of Talmud] of the modern Orthodox world,” said Talia Abell of Chicago, a student at Hannah Sacks Bais Yaakov Girls High School. 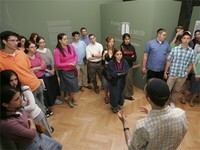 The students spend their mornings in Jewish studies classes. In the afternoons, boys and girls devote their time to secular subjects. On the Wilf campus boys choose between “The World of Finance and Investment,” a practical experience establishing and analyzing a portfolio of investments and working with traders, financial planners, and entrepreneurs; or “Explorations in Genetics and Molecular Biology,” a laboratory experience introducing students to the theory and techniques of molecular biology. On the Beren campus, girls study “Explorations in Genetics and Molecular Biology” or “Computer Design,” using Mac computers to design various presentation materials including Web pages. In the evenings and on the weekends, they participate in an array of college preparatory workshops, a film and discussion series, work out in YU’s fitness centers, and explore New York. Trips have included seeing a Broadway show, the Empire State Building, a Mets game, the Museum of Jewish Heritage, the YU Museum, and Meadowlands State Fair. A different community hosts the high school students every Shabbat. The first Shabbaton was held in Passaic, NJ, followed by retreats to Stamford, CT and Teaneck, NJ. The last Shabbat will be spent in Riverdale, NY. The students were also treated to a barbeque at YU President Richard Joel’s home. “That was a big highlight for me,” said Jonathan Korman of Highland Park, IL, a student at Ida Crown Jewish Academy in Chicago. Mr. Korman was interested in YU for its “mixture of Torah and secular life” before attending the summer program, but spending four weeks on the Wilf campus has solidified his interest in applying.